It is not unusual for BBRR to be called upon to do presentations in classrooms with our education raptors, especially to help students learn about ecology and other science topics related to birds of prey. But raptors are not just for science. 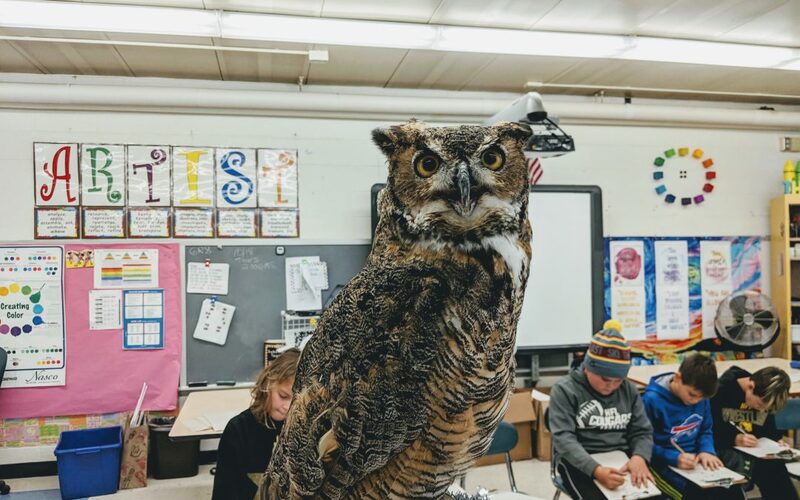 This fall our education raptors were live models for the 5th grade art classes at Manor Elementary School in Honeoye Falls, NY. 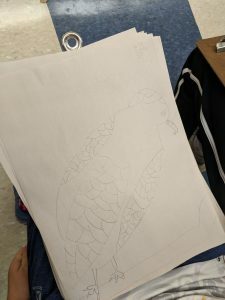 The students at Manor have been doing a raptor art project for several years, but sketching and creating artwork while observing a live raptor is a fairly new experience for them. 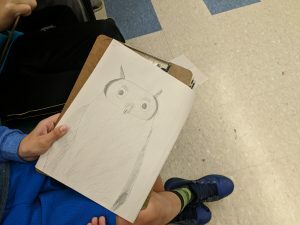 This is the second year in a row that art teacher Cindy Zauski has invited our birds into the classroom to provide her students with a very unique art experience. Our birds visited with 6 classes over the course of 4 separate days. Each class got the opportunity to observe and sketch our Great Horned Owl, and one of our other birds, too. Our Red-tailed Hawk, Broad-winged Hawk and Merlin all made appearances on different days. It was a great opportunity for the students to compare and contrast different birds of prey, and spend quality time observing them. While the birds were very cooperative and relaxed during their outings, the students did get a feel for the challenges presented when trying to work off of live models. The birds don’t always sit still! While the students concentrated on their drawings, information was shared with them about each bird, and questions were answered as they were presented for a very interactive program. The students will be using their sketches to create a final project focusing on the bird’s eyes and facial structure. Mrs. Zauski will select some of the final pieces to be on display at BBRR’s 2019 Bird of Prey Days weekend, April 26-28. We can’t wait for the exhibit, and hope you will venture out to see it yourselves.